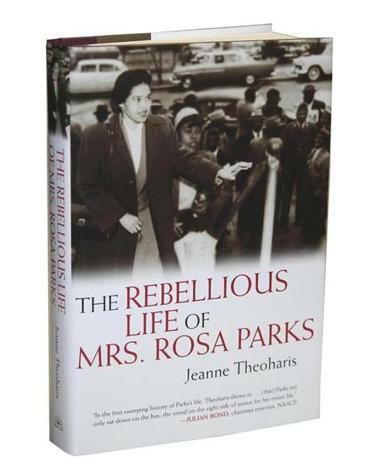 "The Rebellious Life of Mrs. Rosa Parks” by Jeanne Theoharis. Schoolchildren everywhere know of Rosa Parks as a “simple tired seamstress” whose refusal to give up her seat on a segregated bus sparked the modern civil rights movement. But this image of Parks as an “accidental or angelic heroine,” writes historian Jeanne Theoharis, “misses the years of gathering courage” that led to that day in December 1955. Even after her 2005 death, as Parks’s body lay in state at the US Capitol, she was remembered not for her years of activism in the decades before and after her bus stand, nor as a foot soldier in a civil-rights struggle that she saw as ongoing and nationwide, but rather as “the nonthreatening heroine of a movement that had run its course.” In this important new biography, Theoharis argues powerfully for a reconsideration of Parks’s life and legacy. Although hampered by limited access (a legal dispute has closed much of Parks’s archive to scholars), she sketches a portrait of a complex woman whose status as a symbol obscured her deep-rooted, often radical, political work. Theoharis is attentive to the paradoxes of history. One is that the myth of an apolitical Parks served the civil rights movement well by protecting her at least somewhat from the usual red-baiting; another that Parks’s middle-class bearing lent her respectability while allowing even her allies to ignore her actual poverty. Both she and her husband lost their jobs within months of the boycott’s beginning; she wasn’t steadily employed again for more than a decade. The real Rosa Parks was a fervent Christian and lifelong activist. A veteran organizer, in 1947 she served as part of the executive panel of the Alabama NAACP; she also led the Montgomery NAACP Youth Council, studied social action at the interracial Highlander Folk School in Tennessee, and helped clean up the rubble after boycott leaders’ houses were firebombed. After the boycott, Parks moved to Detroit, where she fought against the Northern racism often overlooked in the conventional civil rights narrative. Theoharis succeeds here in doing what the best history books always do: challenging what we thought we knew, replacing fables with flesh and blood. Eloise is a rising academic star — complete with high-profile first book and a job at Harvard ­— when she inherits her sister’s three children, orphaned by their parents’ sudden death. The opening scenes of Leah Stewart’s new novel ache with the loss they all feel, along the precipitous narrowing of Eloise’s world. She moves back to her native Cincinnati to raise Theo, Josh, and Claire; the book skips years and picks up again as Claire, the youngest, prepares to leave home at 19 for ballet training in New York. The others, in their late 20s, still live in the rambling Victorian house with Eloise: all of them seem stuck, dissatisfied, but incapable of moving away. Much of Stewart’s novel revolves around the choices we make in our work — Josh has quit a successful band; Theo can’t finish her dissertation as she doesn’t really want to leave Cincinnati or the house. Each family member has a romantic secret (or two), and some of the lovers’ arguments that erupt among them feel startlingly real. A sprawling novel with some of the off-kilter charm of Anne Tyler’s work, “The History of Us” glows with affection for its wounded, familiar characters. With its inside stories of long editing sessions and leisurely, civilized lunches around Boston, the book will make local readers miss the presence of the venerable Atlantic, long since decamped for Washington, DC. Anyone who writes will wish they had access to an editor like Todd, just as all of us who read will wish there could be more like both of these authors.